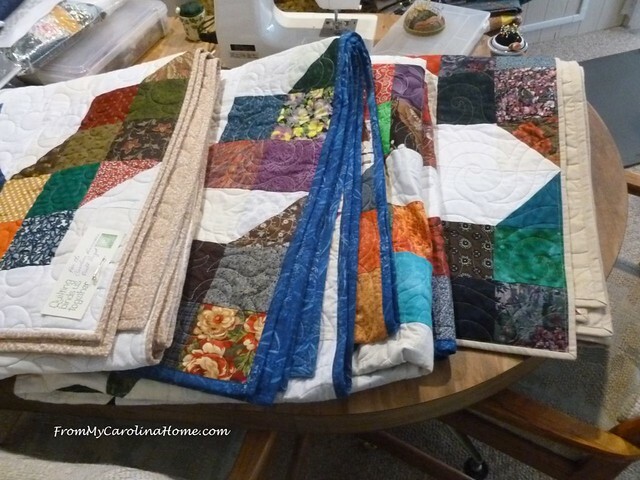 When I started the hurricane project, my commitment was to do five queen size quilts from blocks sent in by readers. These two flimsys were next on the list for quilting. I did the one on the right, and another longarmer friend is quilting the one on the left for the project. I loaded the flimsy on the longarm, using the fabulous backing from Backside Fabrics and more of the wonderful Hobbs 80/20 batting. 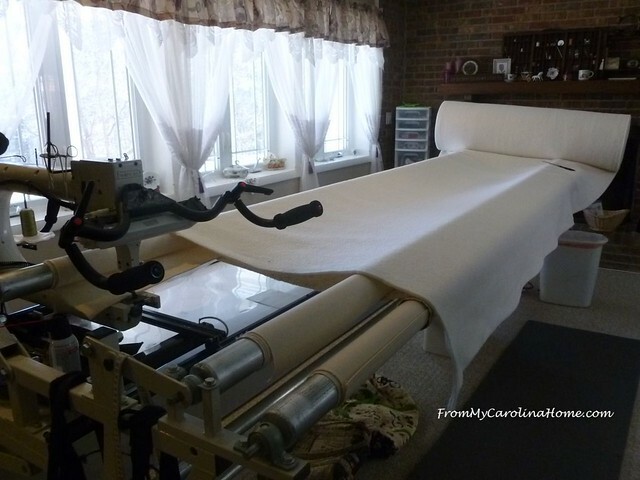 I roll out the batting using the longarm for measuring. Here’s where I muffed it. Without thinking it through, I loaded the top 90 degrees from the way I measured it. Usually I load the longest axis parallel to the bars, but this time the backing was a bit short for that, so I turned it with the shorter side parallel to the bars. I used a pantograph that has lovely cloud-like forms. The thread is a taupe Glide in the top with Bottom Line in the bobbin. And I quilted happily along, not knowing what was coming. Then I got to the bottom. Oh my!! With just barely enough to reach the end edge, I pinned it down and hoped for the best, stay-stitching the edge in place. Whew, it worked! All quilted and trimmed up. 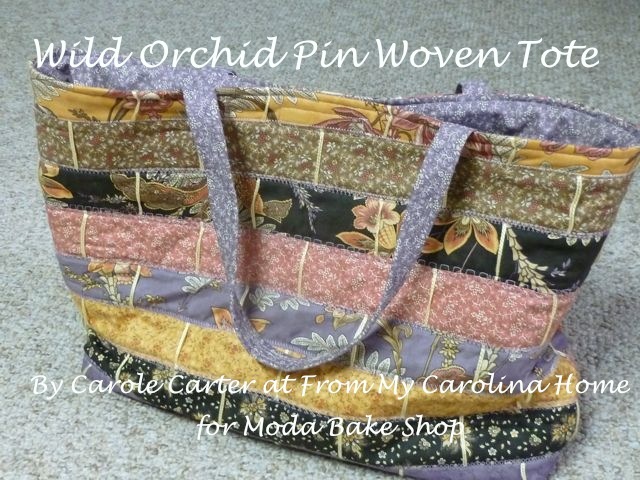 I bound it with the overage from the backing. Finished and placed with the first two, this one is on the left in the picture below. Three queen size quilts are now completed, and will be on the way to Wilmington later in the month. Two issues have arisen that I want to address. Please be sure that your quilts are clean and free of cat and dog hair. I received one that I had to vacuum and then wash because it was dirty and covered in pet hair. Ultimately, I couldn’t send it to Wilmington, instead donating it to a shelter here. Second, please do not send commemorative or holiday quilts. It just isn’t an appropriate use of a breast cancer survivor quilt, or a t-shirt quilt of the places you’ve been, or a Christmas quilt. For those who have lost everything, let’s give them a quilt they can use everyday. Thank you for understanding. 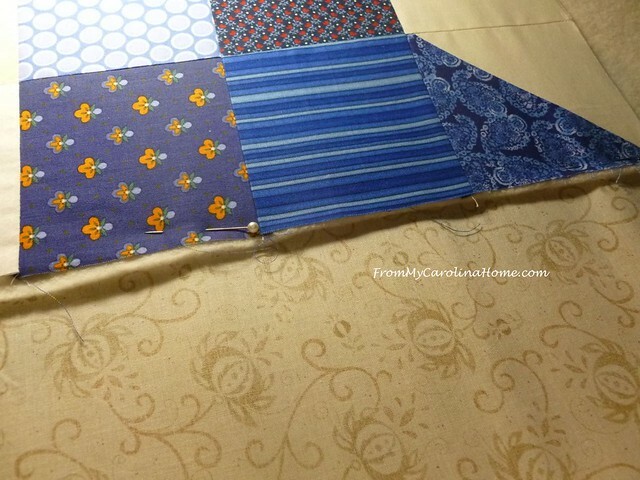 With the size of the Carolina Hurricane Quilt Project, there is no way I could do this without help from friends. Most of what they have done has been behind the scenes, and today I’d like to recognize some of the ladies that have been so helpful. Local friends helping with top construction Sam VanSant, Bridget O’Malley, Bonnie Hartel, Gayle Jones, Mac and Claire Warner, Marti Sofi, Elaine Hudson, Karen Rhoads and Carin Rupp have been invaluable, getting all those hundreds of blocks made into tops. My original request for enough blocks to do 5 queen size quilts was more than exceeded!! We got enough for the 5 queens, plus 3 full size and a twin!!! Donations of batting and backing from Susan Nixon, Judy Sanders and Bonnie Cunningham made it possible to get extra tops quilted from other designs made by friends. Local longarmers Mary Jo Leonard, MaryAnne Gilbert, Chryste Krause, and Rachel in Saluda have been a huge help. These two are in progress with local longarm friends Connie Yow and Laura Suich. Both are full size flimsys sent to me by friends who needed help with quilting. 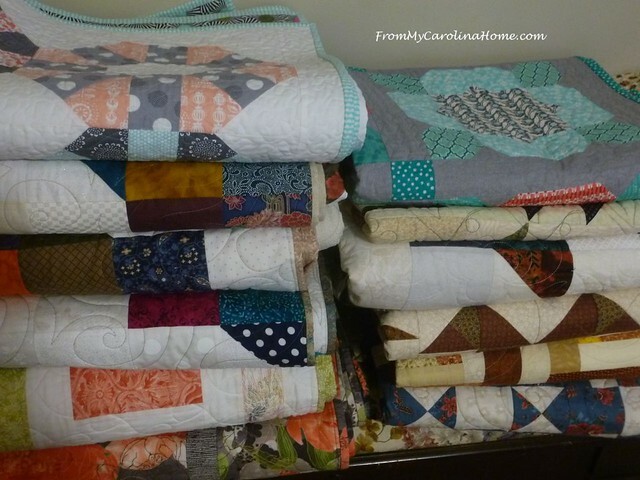 Incredible monetary donations from Vicki Welsh, Linnie Middleton, Lesley Gilbert and Karla have made it possible for many longarmers to help quilt and ship tops made by readers. Because of the help, the longarm quilters were willing to quilt more than one top, and we are caught up with requests, at least for now! I am hoping for a great response in March when the project is part of Hands2Help. Thank you all for your help!! 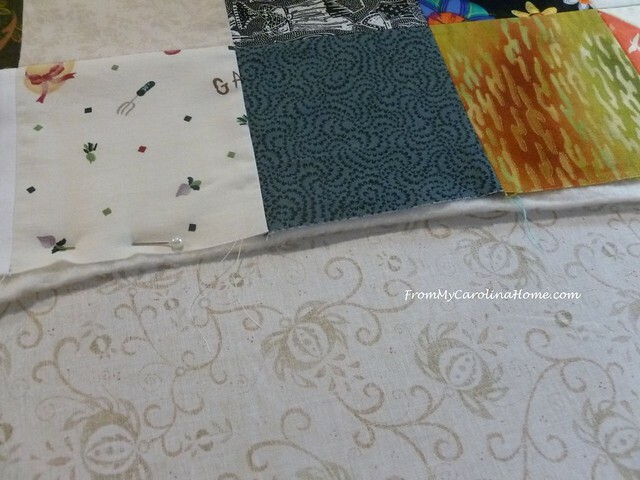 See the linked post on my sidebar if you need a top quilted, or you are a longarm quilter willing to help. 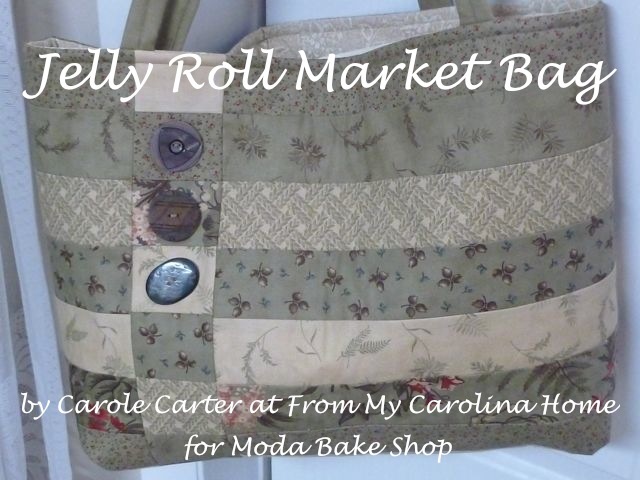 Our runner from Cary (Raleigh area) dropped these off recently, all from customers of Cary Quilting Company responding to their newsletter announcement. There were 15 quilts in this run!! 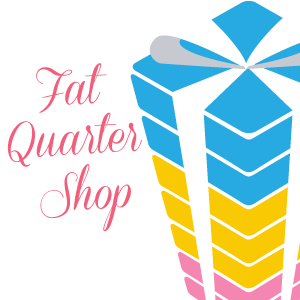 Thank you to all who donated to this shop!! They will be on their way to Wilmington on the 24th, along with twelve more collected at my house over the past couple of months. The ones on the top of each stack here were just delivered to me from the Modern Quilt Guild in Greenville, SC. Once again for future reference, the first post is still linked to the button on the sidebar with all the FAQs and details. If you are on a smart phone, the sidebar info is at the bottom past the comments. You can click HERE to see the original post with all the FAQs and details. Aren’t these quilts wonderful? What are you quilting now? What a wonderful response to your request! These are beautiful. It is such a great block pattern too. I have “delivered”the top with backing to another Queen Bee member who said she would long arm quilt it. THANK YOU Sharon Jobin for doing this for the Bee. The Queen Bees made lovely blocks for a nice sized top, and I put it together in (gasp) November… I’m so glad the project is ongoing. I have extra blocks and will hold them for the “next time” we need them. Thanks for keeping the info up on the blog, so when ours is finished I have the details for shipping. What a wonderful blessing these quilts will be. Thank you for all you do. This is what keeps me quilting. 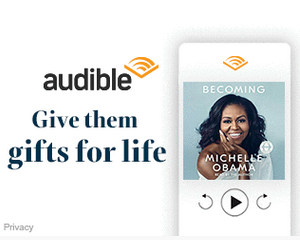 Stories like this. 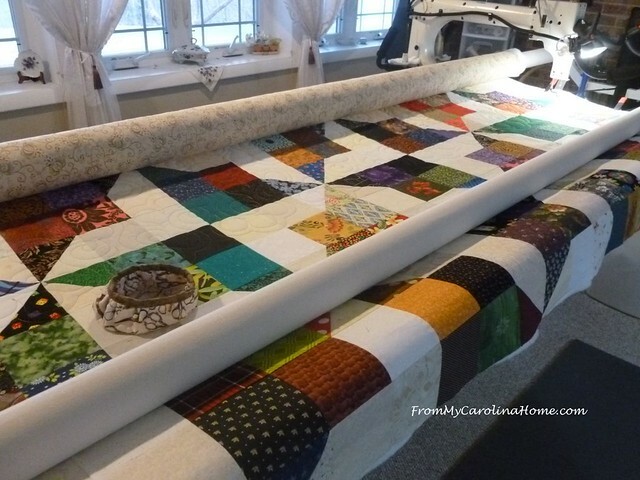 All behind the scenes there are quilters all over the country who do this. Every once in a while a story like yours creeps into the news but most of it is done behind the scenes. I am grateful to each and every quilter who gives up his or her time to do this for humanity and our great country! Sew many amazing folk working together for a great cause.. hugs to all. What an incredible project this has become and I admire the energy from all of you that is making it happen. wonderful and very pretty quilts. I know the recipients will be touched by the attention and care. 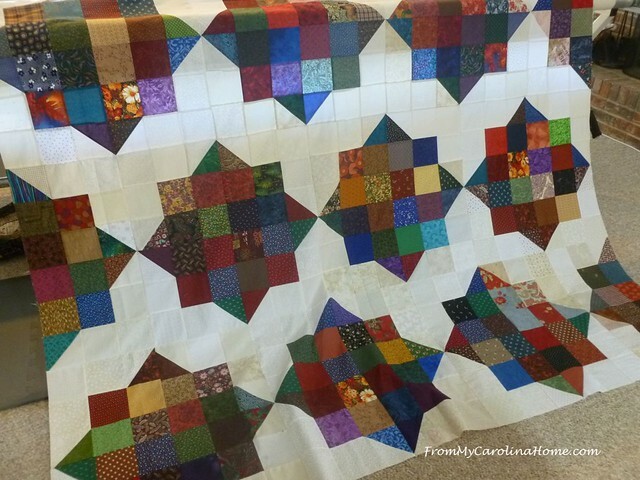 Very impressive response from local quilting buddies and great quilt results. I can only imagine the faces of those receiving these beauties! Warms my heart and sure adds fuel to the fire! I’m sure all of these quilts will be appreciated by the recipients. Thank you for coordinating everything! thanks for the update. Wonderful work by you and all who have contributed. 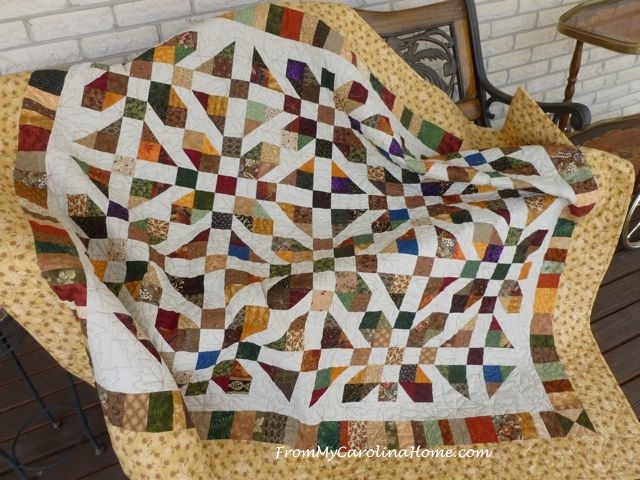 These quilts are SOOO wonderful! I barely remember making a few blocks for you, it feels like forever. Yet, those recovering from the hurricane season will not ever forget. Thank you for all that you do and continue to organize for those in need. You are amazing! This is just all so amazing!!! 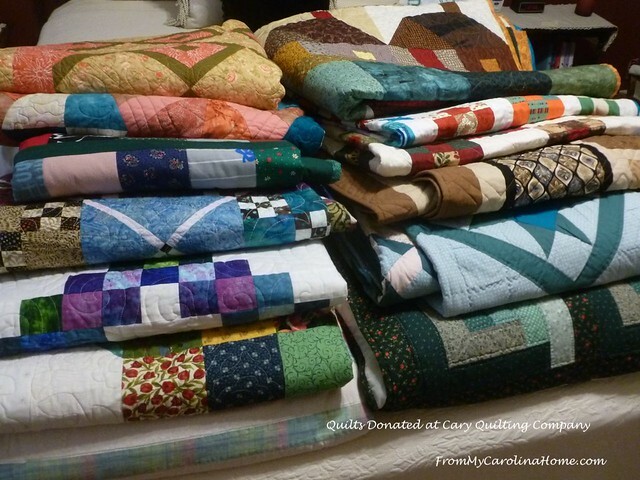 Quilters are the most generous, caring people. I love it!!! And thanks for organizing this Carole! It’s awesome!! Thanks for the update. 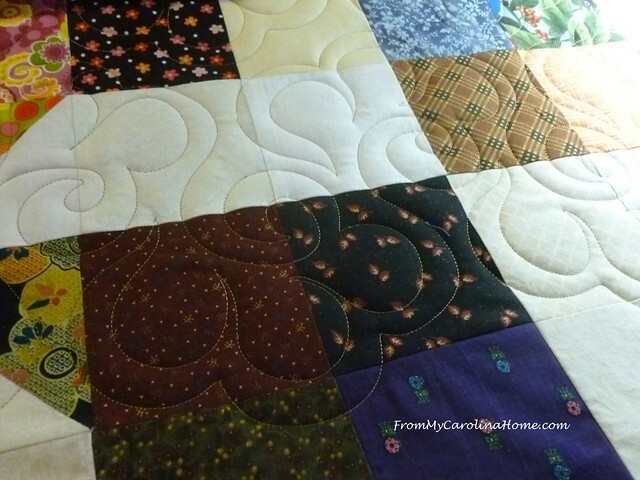 I’ll be receiving 6 more blocks this week, and then will begin assembling the quilts from our group. 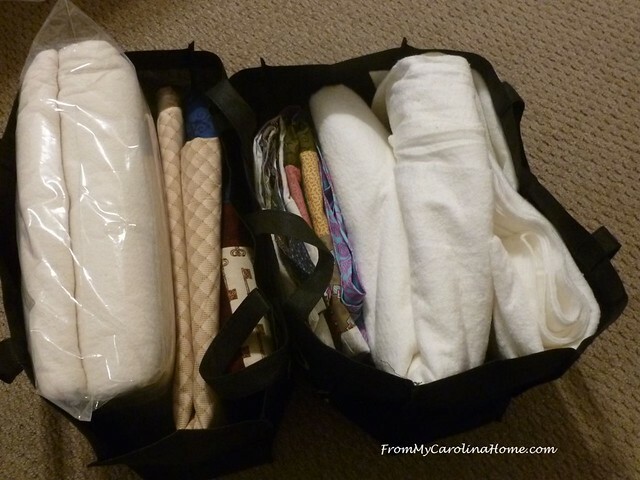 We will have enough for two lap quilts. Please make one larger quilt instead, we need bed size quilts most of all. Thank you!! 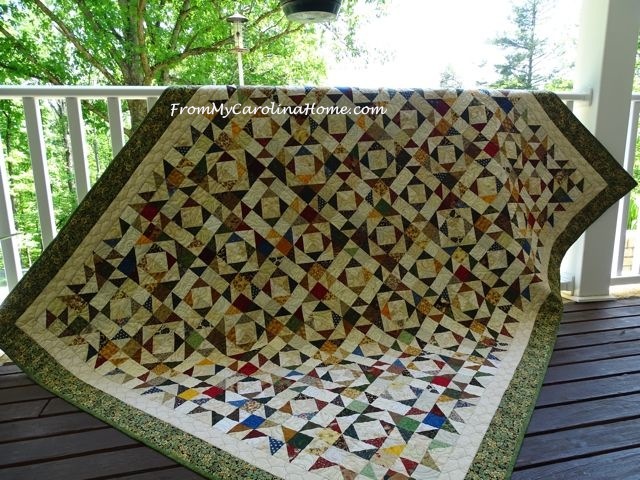 Hello Carole, Reading your post and all of the comments just makes my heart sing with love and pride at what you and so many other quilters and long arm quilters, plus every person involved in the whole process of this are all doing. Thank you so much for sharing and have a fabulous day! Wonderful post about an amazing project. These quilts will serve as a tangible reminder of the love and support poured out to the hurricane victims. 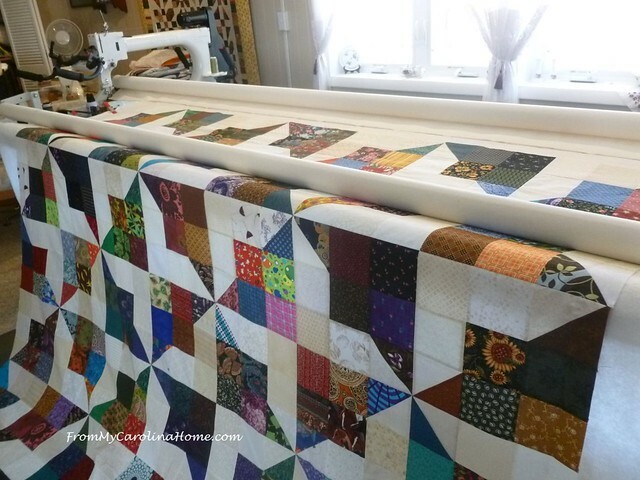 Are you still in need of long arm quilters? If so, please let me know. My email address is below. 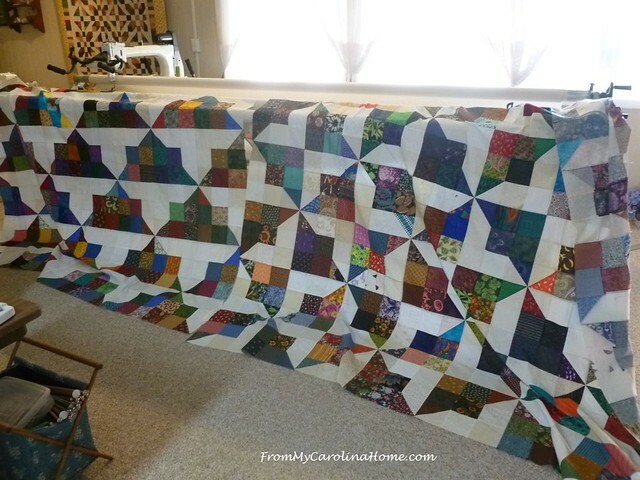 A flimsy is the pieced top before it is quilted. How wonderful this project is such a success. Great seeing so many people work together! I do like that puffy cloud stitch you showed today. I like the puffy cloud panto you used, great quilting. Could you tell me the name of the panto? Thanks. what is the name of the blocks , I would love to do one ? It is called the Perkiomen Valley block. 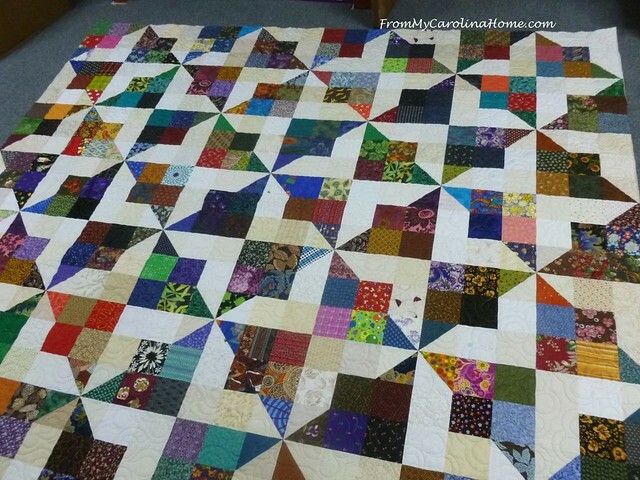 There is a download of the block on the main post for the Carolina Hurricane Quilt Project. A true labor of love! God bless you. Common threads of Louisa in Virginia donates to children in early education programs and will be working on quilts of valor this year. The quilts shown are beautiful. Not long after I sent blocks to you, we here in Florida suffered through Hurricane Michael. Donna Miller started “Quilt Blessings for the Panhandle” and has worked hard to coordinate the creation of many quilts…I’m guessing at least 1500 now. It is a huge undertaking as you know. Such need exists and many people lost everything. Even here in Tallahassee, the hurricane did a lot of damage but we were so fortunate to have only a few trees down. I would like to thank you for your huge effort in making people aware of the need and aware of the nature of quilters–a very loving and generous group of people! The quilts ARE wonderful, and people have been so generous. When I return from Arizona, I will be finishing two that are starting, and I think I can get one more for Hands2Help. If a longarmer needs batting, let me know in March or later. I just won’t be home for a few weeks now. 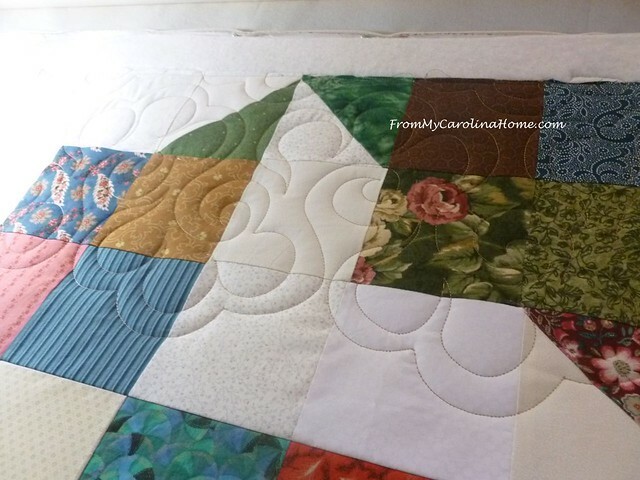 The block is called Perkiomen Valley, and a free pattern download with setting ideas is available on the Carolina Hurricane Quilt Post linked to the button on my sidebar. It is lovely to see the collection of quilts for donation. And I am so pleased it worked out with your quilt – that was a close call but a great result in the end. Thank goodness, the batting just made it to the end of the quilt. 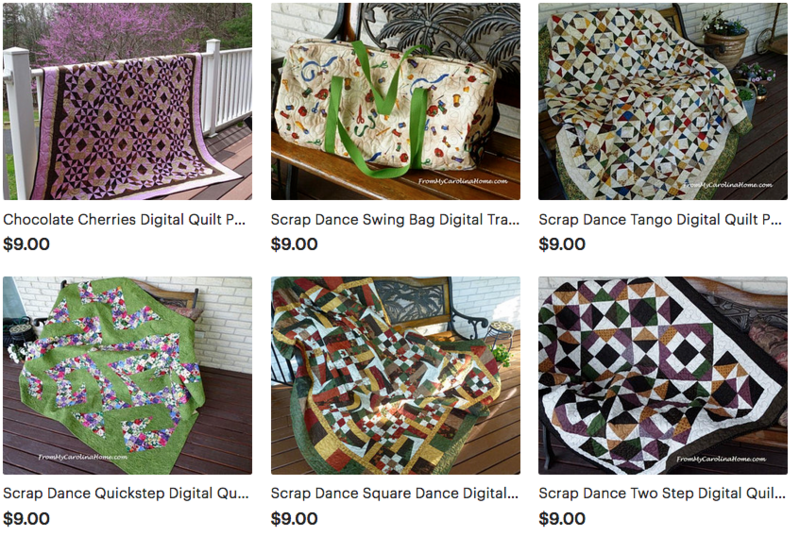 I’m so glad you are getting such good responses for quilts! I would have felt very smug about that batting working out the way it did. That’s a very good day indeed!